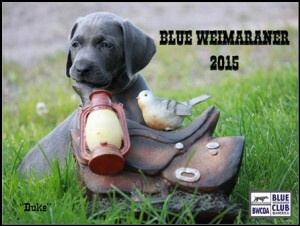 I am very excited to announce that the 2015 Blue Weimaraner Calendar FULL PREVIEW is now available! It will be sent to the printer this week in the hopes that the finished product will be delivered to the shipping department “Liz” prior to Thanksgiving. We still hope to begin shipping by December 1st. To see the full preview and to purchase your copy, click on the cover photo above.